Research fields: Sunspots, fine structure in solar photosphere, high spatial resolution photometry and spectroscopy, interpretation of spectra, image processing, time-series analysis, instrumentation. Since 1979 in the Astronomical Institute, Solar Department, since 1995 Head of the Working Group Structure and Dynamics of Solar Atmosphere. Since 2004 Deputy Head of the Solar Department and since 2012 Head of the Solar Department. Cooperation with institutions in Spain, France, Germany, Austria, and USA. 2002 - 2008 Vice-President of JOSO. Since 2006 national representative in the European Association for Solar Telescopes EAST. Participation in the projects of the 1.5-m solar telescope GREGOR and of the 4-m class European Solar Telescope EST. Author and co-author of more than 160 astronomical publications. 1978 - graduated from the Charles University, Prague, Master's Degree in astrophysics. 1981-1985 external PhD student at the Leningrad State University and Crimean Astrophysical Observatory. 1985 - PhD in astrophysics, Leningrad State University. 1990 - 1992 - Postdoctoral Fellowship at the Instituto de Astrofisica de Canarias (IAC). 1993 - three-month European Community Grant at IAC. 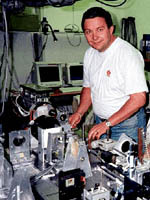 1999 - Visiting Professor at the Karl-Franzens University, Graz. 1999 - 2000 - one-year sabbatical stay at IAC. 2003, 2005 - two-months research stays at Observatoire Midi Pyrénées. 2007 - DSc. in astrophysics, Academy of Sciences of the Czech Republic. Here is the list of some publications that might be interesting for you. They can be downloaded in the form of .PS and .PDF files or using links to other pages. More publications can be found in the ADS database. Here is a link to my library of IDL routines. Here you can find my "private" page, dedicated mostly to ultralight flying. © 2004 SDSA. This page is XHTML & CSS valid. Created by Czechline.